Sometimes it's hard to keep up. Between seemingly daily San Francisco restaurant openings and brand new food websites, it seems like change is a constant. And like all things, some of those additions are good and some--not so much. So today I'm going to show you around five new food websites that are aiming to make a name for themselves by finding a little niche in the market. Who knows? Maybe you'll find one you like (I did). Kitchen Monki touts themselves as "your ultimate cooking utensil." The site is designed for home cooks and aims to be a place to store recipes, set up a weekly meal plan and generate grocery lists working from that plan. It's basically like a technologically advanced version of what I remember my mom doing on legal pads while we were growing up. It's not for me, personally. I'm far from that organized and rarely know what I'm going to have for lunch let alone what I'm going to have for dinner next Friday. But I can see it catching on, and it's a great tool for busy families who want to lay out their weekly meals and move on to other things. Once you generate your grocery list, they'll actually shoot it over to your iphone or blackberry which is pretty cool and they have an easy-to-use sort and search function to help you find exactly which recipe you're looking for based on ingredients, meal types or courses. So all in all, I think it'll stick around. If you're a planner and have a few people in your household, it might be worth checking out. 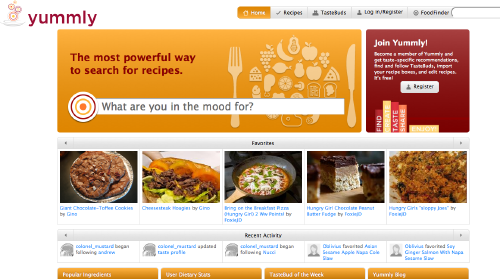 Yummly started up in June and is, from what I can tell, one of the first semantic search sites for food and recipes. They claim to have over 500,000 recipes from all over the web although when I did extensive searches, it seemed most were mainly from Epicurious and Food.com (Formerly Recipe Zaar). You can search by ingredient, nutrition, taste, price, and even by allergy. Then when you find a recipe you're interested in, Yummly will pull up its full profile, showing a rating by taste profile (salty, savory, sweet, sour, bitter) and nutrition facts. I found the taste profile to be a little kitschy and wondered who exactly deemed each recipe as such: have they made and tasted them all? 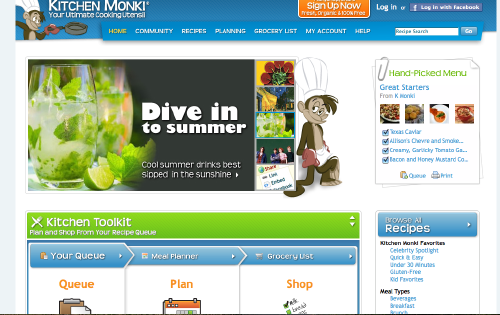 You can become a member of the site for free (then you'll be coined a "tastebud") and will receive taste specific recipe suggestions, can connect with other "tastebuds," and can organize and edit all of your recipes. Members can "favorite" things so you can begin to establish a rapport with other people online and see what they're cooking. I like the idea of this site, I just think the execution needs some polishing. More variety of recipe sources would help, and sometimes--call me crazy--the social media component of a website or concept could just be left at home. I'm not sure it's working here. Personally I'd never join because there's no part of me that wants to be coined a "tastebud" and between twitter and facebook, who has time for more online networking? I smiled when I came across Punk Domestics a few weeks ago. Why? Because it's just downright cool. The site itself is largely user-generated, meaning folks join and can then post relevant content about preserving, canning, pickling or "otherwise celebrate the resurgence of the domestic arts our forebears held so dear." What's cool about the content is it literally links to other folks' blogs so you are introduced to blogs you'd never heard of and techniques that may be new to you. 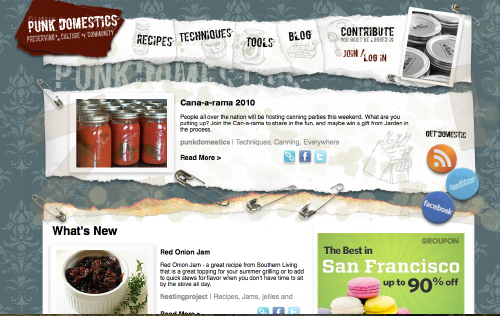 In addition to canning and pickling recipes, there is a "Tools" page (self-explanatory) and a "Techniques" page with great tips to help the at-home "punk domestic" get going. The site isn't too busy, its scope is pretty narrow, it's organized well, and with the popularity of urban farming and preserving, I think it's going to be a success. The concept behind Homegrown is a little tough to pin down at first. So let me try and lay it out for you. 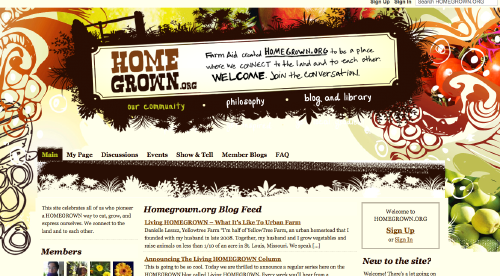 Their introduction states that they're an online community of people "interested in all things homegrown: growing, cooking, crafting, brewing, preserving, building, making and creating." So when it comes right down to it, this is a spot where folks can share ideas and book recommendations or ask questions in the Forum. You can also join groups or mini communities that are more topic-specific (for example, join up with people who are into canning). You can also start a Member Blog, where you're posting original, relevant content on the Homeroom site. There's a lot to like here in my opinion because it's all about the genuine sharing of ideas and interests in an organized, relevant way. Like-minded folks seem to finding it and relishing it. That's a good sign of things to come. 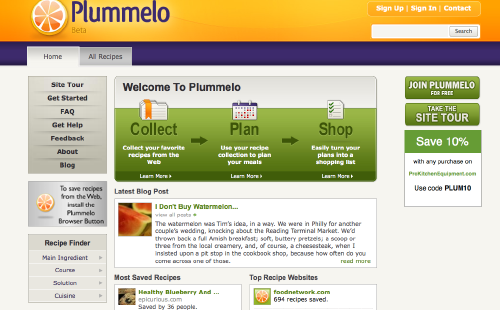 Plummelo is in its beta version and is similar to Kitchen Monki in a sense but I almost like it better. While the design is starkly simple and a bit uninspired, the user has much more control over the content (so you're not just working with recipes from Epicurious and Recipe Zaar). The site itself is designed to help cooks save recipes that they find anywhere online and move forward to plan their shopping lists. Once you join for free, you'll have a little Plumello Browser Button on your browser's toolbar and it automatically stores recipes you like that you've found from all over the web (food blogs, online magazines etc.). Then from there, you can share them, organize them, and generate shopping lists. Cool idea. I think their success depends on the number and variety of users and the content they'll bring to the site. So there you have it. If anything, creativity abounds here as people try and pull away from bigger food sites and infuse their concept with elements of sharing, conversation, and social networking. I suppose the main question is how well they pull apart from the big boys, what kind of niche they create, and if they can capture new user's attention. Some are certainly doing it better than others. Those will be the ones I'll return to.